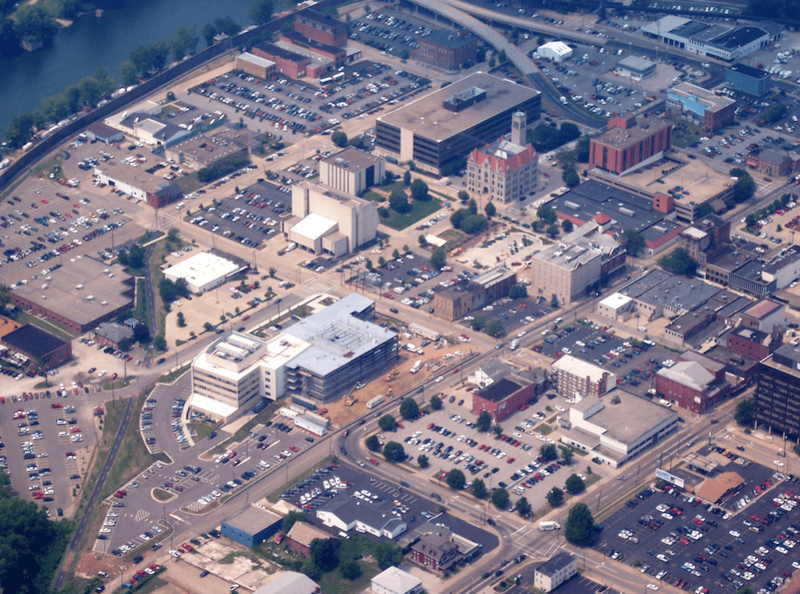 Parkersburg, West Virginia, the runner-up in Parking Madness 2015, was Donald Shoup’s choice for worst parking crater. All the entries deserve a prize, but I have to choose Parkersburg [above] as the worst crater, for several reasons. First, of course, is the city’s name. Second, Parkersburg has parking structures surrounded by surface parking lots. Third, parking lots separate the city from a beautiful river. And fourth, Elliott Lewis clearly explained why Parkersburg’s parking crater is so awful. Other nominators also wrote superb indictments of their cities, including Marshall Allen for Syracuse, Bill Basford for Waterville, and Nick Sortland for Amarillo. The upside of these obscene craters is that we have immense areas of vacant land ready for redevelopment right where people want to live and work. If cities remove their minimum parking requirements, these parking craters can become exciting parts of a healthy downtown. The four images below suggest the possible improvements. The building is as big as the city will allow, given the number of parking spaces provided. Suppose San Jose removes its minimum parking requirements, so some empty spaces on the perimeter of the parking lot can be used for housing. The apartment building photoshopped onto one edge of the parking lot shows that land now devoted to parking could be developed as housing. 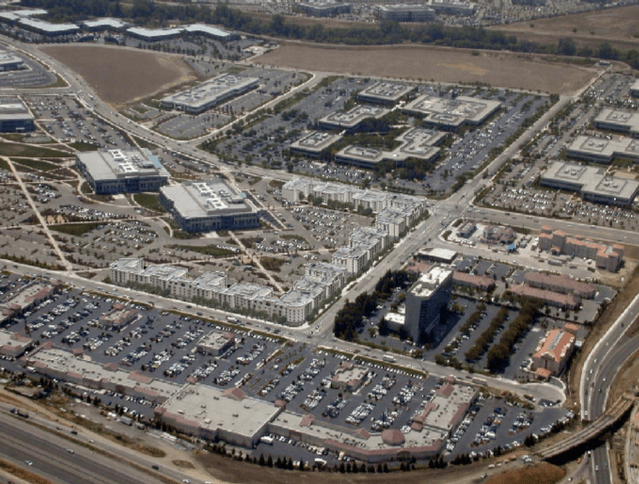 Employees who live in these buildings could walk across the parking lot to work. The housing could be built without parking, greatly reducing its cost, and the existing parking spaces could be shared between the offices and the apartments. So the upside of our current mess is that we have an accidental land reserve for housing right where we need it most. The land is already assembled in single ownerships and the sites are cleared for construction. The housing can be built without new parking because the existing spaces can be shared between office buildings and apartments. To avoid a parking shortage, the owner will have to unbundle the cost of parking from the rent for both apartments and offices, so car owners will pay only for the parking spaces they use. Some residents who work in a nearby office building may find they can easily live with no car or only one car, and they would appreciate the freedom to rent an apartment without paying for two parking spaces. All this can be done without displacing anyone because no one lives there now. New Urbanists refer to perimeter buildings that mask a parking lot as “liner buildings,” and they can be any type of development, including garden apartments, row houses, or shops and restaurants. The term “liner” suggests that the wrapping is a superficial way to hide what is inside, but in this case the wrapping would probably be far more valuable than the parking spaces it would replace. In parking, as in everything else, there are opportunity costs. Money and time now spent on cars, fuel, and parking will be available for something better. Removing the parking requirements for both housing and offices can produce a cascade of benefits: shorter commutes, less traffic, a healthier economy, a cleaner environment, and more affordable housing. And the benefits don’t stop there. If we reform our misguided planning for parking, the money now spent on cars and fuel will become available for other things. Cars and fuel are often imported, but we cannot import apartment buildings. Shifting spending from cars, fuel, and parking to housing construction will increase the demand for labor in a host of professions, such as architects, carpenters, electricians, engineers, gardeners, glaziers, laborers, lawyers, locksmiths, painters, plumbers, real estate agents, roofers, surveyors, and even urban planners. Importing less oil and hiring all these people to build infill development will boost the whole economy. But to get these results we will have to do three things. First, remove off-street parking requirements in zoning ordinances to make infill development possible. Second, charge market prices for on-street parking to prevent parking spillover from the new development. And third, spend the new revenue on neighborhood public services to make these market prices politically acceptable. The results will address many important problems Americans now face. The upside of the mess we have made is that we have an accidental land bank readily available for job-adjacent housing. But this land is now locked up in required parking. If cities remove their unwise parking requirements, infill development on American parking craters can be the world’s largest land-reclamation project outside the Netherlands. Congratulations to Streetsblog and Angie Schmitt for showing us a historic opportunity. Locating housing next to offices like this is a great temporal use of the parking as well. The people who live in those photoshopped apartments who do have cars, if they are employed, will likely have them parked somewhere else during the 7am-7pm hours that the office tenants are most heavily using them now. This could work in San Jose, but not Camden. In my opinion, the title “most improved” goes to the city of Toronto. It had plenty of parking craters in the 1980’s, but there are very few surface car parking lots in downtown Toronto today. All of this assumes the parking craters are due to minimum parking requirements. I have no doubt that this is true in a growing, high-demand city like San Jose. But is it true in smaller and/or declining cities? Or are the parking craters a result of low demand for other uses? Shoup Dogg on the Streetsblog! That’s a false dichotomy, there. With a term as fuzzy as “parking crater”, there’s no way you could identify a single cause. From what I see, though, really depressed small towns don’t develop parking lots — they develop weed lots. The parking craters are also due to our separation of uses. People who work in a building often must live 10 or 15 miles away and with no transit options they must drive a car to work. Well designed mixed use can alleviate some of this. Those buildings Shoup put up will also need critical amenities like a grocery store, pharmacy, a few good eating options, a good wine/cheese/beer store, and a bike shop selling Workcycles Omafietsen. It would work in San Jose because of the incredible development pressure in the region. Developers would be lining up to build those perimeter buildings even before the ink is dry on the law zoning them. Camden is suffering the opposite fate, it is the Detroit of the East. Note that the building being taken by eminent domain for parking is in disrepair and vacant. The economy of the region is now able to support a decent urban core in (Philadelphia) Center City and University City. But the rest of the city surrounding it is still full of vacant land. Why would anyone build (and move into) in Camden if there are so many areas on the edge of Center City where they can build instead? It will be a long, long time before there’s much desire to build in Camden. In the meantime, the city feels lucky to get whatever tax revenue it can for the visitor attractions it HAS built (aquarium, etc). Believe it or not, the acres of grass and parking lot are better than what was there before. No, the dichotomy is real. Basic economics. When a resource is cheaper, people consume more of it. When land is cheap enough, people build surface parking lots on it. Look around Philadelphia, I doubt it has zoning laws with minimum parking requirements for its corner drug stores. Same thing for the McDonald’s at 125 St. in Manhattan. 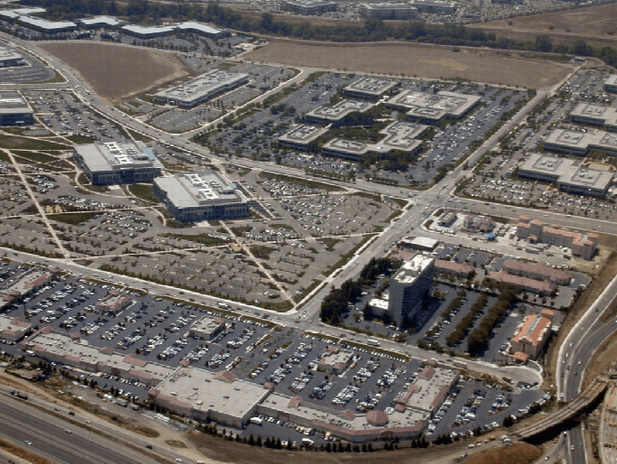 Surface parking is simply a profitable form of land speculation. But I agree with you as well… if land values fall far enough, or if there is NOTHING nearby that anyone wants to park for, then no one even bothers to build parking lots. I’ve seen that as well. In that sense, a parking crater can be considered an (economic) step up from a weed-strewn vacant lot. Ah. Thanks. I found the term “urban triage” a while ago, suggesting that in any given metropolitan area moving towards higher density and better walkability, there are some places you might just have to write off for the present. I thought that was a pretty harsh thing to say. But it sounds like Camden may be such an area. The hope would be that it would come along eventually, right? Seems like your example may be based on lifestyle more than economic health. If a sufficiently large percentage of the population uses cars, then businesses will feel compelled to offer free parking, regardless of regulations. A business like McD’s that caters to cars will feel even more compelled. Corner drug stores like Walgreen’s and CVS — the free parking and corner lot is part of corporate strategy. 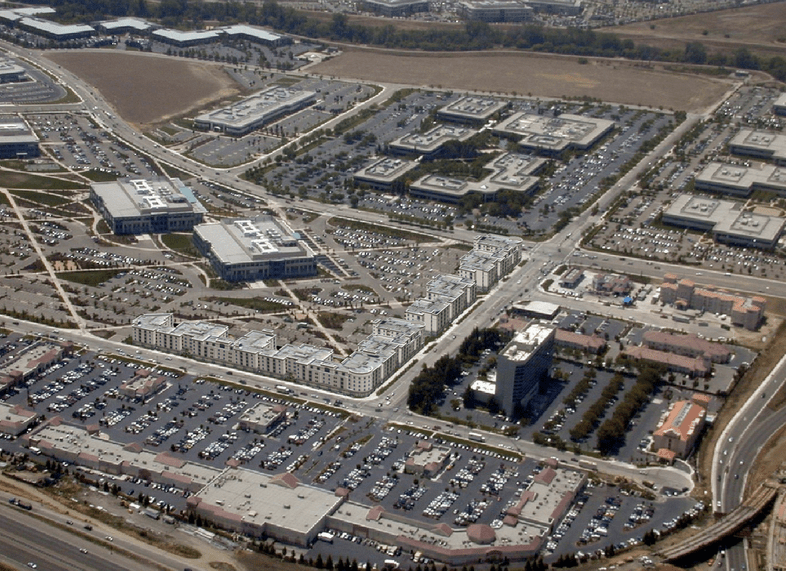 Yes, this is part of the Ciscoplex in Milpitas. 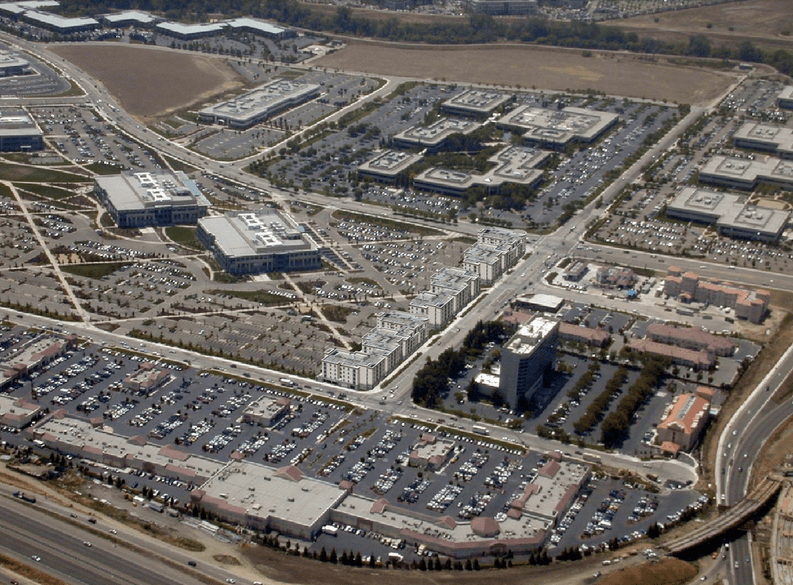 We can forgive Streetsblog for mislabeling this location because most people have never heard of Milpitas. A lof of San Francisco residents would be hard pressed to find Milpitas on the map even thhough they’re only 50 miles away. As for San Jose, the downtown was pockmarked with parking a couple of decades ago. After multiple attempts to revive downtown it seems to be finally taking hold. One by one the parking lots are being replaced with multi story office and residential buildings. I agree with the commenters above that it takes a degree of economic vitality to make this transformation successful. But more importantly it takes participation from the city. San Jose abandoned automobile LOS requirements in key development areas (including downtown) which spurred denser development. And the city has been deploying road diets in the older constrained core which is finally allowing some of the bike network to link up. A few days ago I was at the corner of Stockton and The Alameda. A decade ago that area was a dead zone and just a traffic outlet for downtown, despite being a block away from the second busiest rail station on the west coast. Now with new development that corner is buzzing with pedestrian activity.